Photo: Group shot of parliamentarians from across the commonwealth. 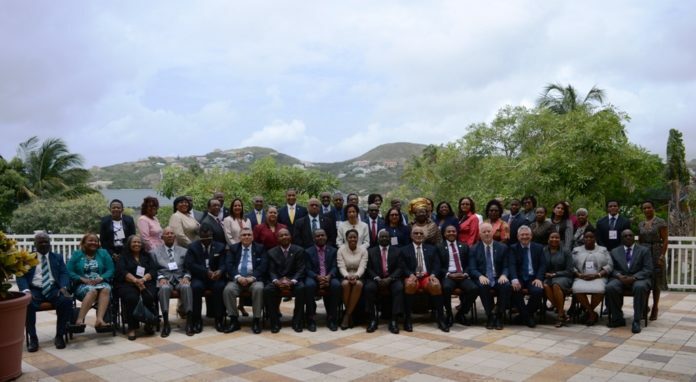 The Honourable Michael Perkins, speaker of the federal parliament in St. Kitts and Nevis, noted in a press release that the theme is very important, especially as it relates to the media and democracy. Perkins explained that there is a love-hate relationship between politicians, parliamentarians and the media, which makes the theme vital and timely. He noted that it is his hope that during the conference there will be discussions on why this is. He said that it is also his hope for participants to use the conference to find ways to foster a better relationship between the media and parliamentarians. “As a vital umbrella, our regional CPA branch … is ideally placed to forge better links that would make that above objective of fostering a better relationship with the media possible,” he said. “Having said that, the truth of the matter is that throughout our region, our parliamentary branches are not functioning at the level to which they should,” adding that it is his belief that the root of the problem may very well be the relationship between members of government and opposition members. As part of the celebrations, there will be the 13th Regional Youth Parliament Debate, with 13 presiding officers or speakers already registered. In addition to the speakers, there are approximately 90 delegates made up of elected and nominated parliamentarians and also clerks of the various parliaments. A forum on “Seeking to Increase Women’s Political Participation” was held June 17.